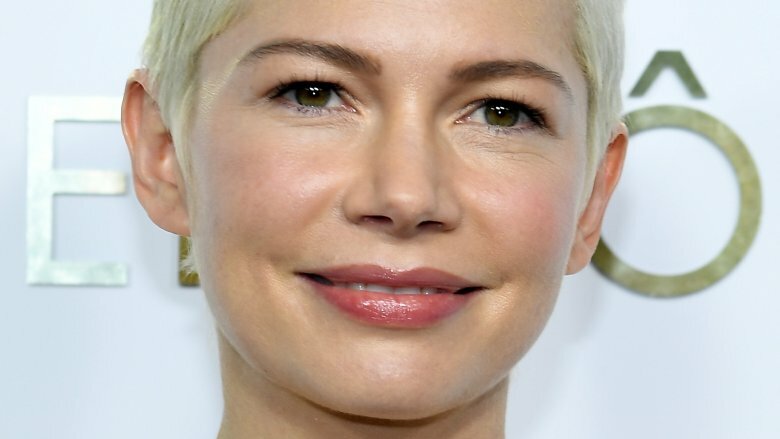 Congratulations to Blue Valentine actress Michelle Williams, who wed Mount Eerie frontman Phil Elverum in a secret ceremony! In her cover story for Vanity Fair's September 2018 issue, Williams revealed that she and Elverum were planning to marry in a wedding in the Adirondacks. But her interview for the magazine took place back in June, so, by now, she and her partner have already tied the knot, though details about their big day remain scarce. The magazine notes that only "a handful of friends and their two daughters" were present for their exchange of vows. Williams' surprise marriage comes over a decade after her former partner Heath Ledger, with whom she shared daughter Matilda, passed away after taking a toxic cocktail of drugs, including oxycodone, diazepam, hydrocodone, and doxylamine. Though Williams and Ledger had broken up in 2007, the Dark Knight star's death still, of course, greatly impacted her. Calling her "heartbroken," a friend of Williams told People magazine in 2008, "it's one thing to lose someone so close to her, but the fact that she lost Matilda's father is crushing." Still, after losing Ledger, Williams remained hopeful that she'd find love again. Wanting to find another man to love her with the same "radical acceptance" with which Ledger did, she shared with Vanity Fair that she "never gave up on love." Elaborating on her epic relationship with Ledger, she told the magazine, "I always say to Matilda, 'Your dad loved me before anybody thought I was talented, or pretty, or had nice clothes.'" Williams' new husband, Phil Elverum, is also familiar with devastating loss, as his wife Geneviève Castrée, died in 2016 after receiving a diagnosis of stage-4 pancreatic cancer — just four months after giving birth to their daughter, Agathe. While Williams and Elverum haven't completely opened up about all the details of their romance, which the actress calls "very sacred and very special," it appears that their mutual understanding of love and loss helped them form a strong bond. "Obviously I've never once in my life talked about a relationship," Williams admitted in her Vanity Fair interview, "but Phil isn't anyone else. And that's worth something." Remarking on their admiration for one another, she explained, "Ultimately the way he loves me is the way I want to live my life on the whole. I work to be free inside of the moment. I parent to let Matilda feel free to be herself, and I am finally loved by someone who makes me feel free." It's unclear when Williams and Elverum first got together, but the two are said to have moved in together sometime in July 2018 when the musician and his 3-year-old daughter moved from Anacortes, Wash. to Brooklyn, N.Y. to live with Williams and 12-year-old Matilda. Prior to her relationship with Elverum, Williams was thought to be dating Andrew Youmans, a financial consultant based in New York, in January 2018 (via People). The two even sparked engagement rumors after Williams was spotted wearing a sparkly diamond ring at multiple events around that time. However, Williams denied that it was an engagement ring, telling the press that it was simply "beautiful jewelry." With her wedding to Elverum having remained under wraps until the release of her Vanity Fair cover story, Williams joins a long list of celebrities who got hitched in secret. Other A-listers include "Bodak Yellow" rapper Cardi B and Migos member Offset, who tied the knot in September 2017 — one month before Offset publicly proposed to his wife during a concert in Philadelphia. After news of the couple's marriage made headlines in June 2018, Cardi B reacted to the media attention by stating, "There are so many moments that I share with the world and there are moments that I want to keep for myself! Getting married was one of those moments!" Can't say we blame Cardi B and Offset for wanting to keep their special day to themselves, and we suspect that Williams and Elverum simply wanted the same privacy for their wedding.